This is the new chapter which combines the Chico Organic Gardening Newsletter with the Valley Oak Tool Company Newsletter. I want to call it the Planetary Local Organic Gardening Newsletter, but nobody else likes that idea. If you have a name, please email us. We are soliciting articles and gardening tips & questions. If you are interested in supporting this newsletter with a donation or a business card sized ad (relevant to local sustainable living only, please) let us know. Please forward this newsletter to anybody and everybody. We plan to publish at least one a month. We are looking for articles and writers (no pay at this time). You can unsubscribe by clicking here. 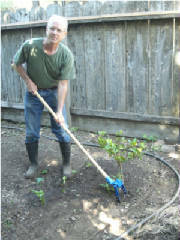 You will love this heavy hoe for grubbing large weeds in tight spaces. We basically fabricated a special socket end to a 60 inch eye hoe handle to which you can attach a 5” blade assembly or a 3 or 4 tine cultivator. This is a heavy hoe that digs in easily. It is not as easy to lift as a conventional stirrup hoe, but the hoeing itself is a lot easier. Cuts on push stroke and pull stroke and on pull stroke. $80 plus $7 shipping with a 5” blade assembly. $45 plus $7 shipping without the blade assembly. Broadforks are excellent for breaking open compacted soils deeper than a rototiller or spade. Those 12” tines are 2” longer than the main competitor’s broadforks. You don’t have to sink them down to the tread bar, but you can. It is best to broadcast compost and soil amendments prior to broadforking, as the amendments will trickle down into the cracks. This is especially useful for rock phosphate, since phosphorus is leached very slowly. Stout wooden handles, stiffer tines, and a wider treadbar make for a tool that is durable, reliable, and easier on your body. The ½” tines are reinforced with 3/16" welded steel gussets. These strengthened tines are much more resistant to bending than most broadfork tines. The 5/8” tines are more resistant to bending than most competitor’s broadforks, and can be realigned if bent. The tines are turned to a point instead of cut. This reduces resistance. All 3 models are 24” wide overall. The 4 tines models have tines 5” apart, so the tine width is 15”. The five tine model has an 18” width between tines. Four tines are recommended for heavier soils. The 4 tine with ½ “ tines (#1) is the easier to insert into the soil. The handles are ash post hole digger handles, 1½" in diameter. Replacement handles are widely available for about $10 each. PICK UP LOCALLY AND PAY NO SHIPPING. TEST OUT THE WHEEL HOE AND OTHER PRODUCTS. YOU WON’T KNOW HOW VALUABLE IT IS TO HAVE A WHEEL HOE UNTIL YOU HAVE USED ONE. Call us to make an evening appointment and we will demonstrate the uses of the wheel hoe and give you the chance to use it. 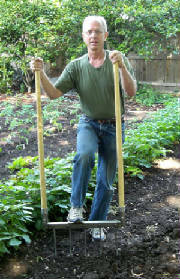 Also if you and some friends want to try the wheel hoe out at one of your houses we can arrange that too. We have had a wet and cool spring, probably due to ocean surface temperatures in the Pacific. But recent warmer days and nights are signaling that it is time to plant your summer garden. What to plant now: Get your tomatoes, peppers, and eggplant starts and plant them. It is best to buy healthy local organic starts. Towani Farm, Shambani Organics, and other growers have plants available at the Saturday Farmer’s market. Sawmill Creek Farm, has superb starts at the Thursday night Farmer’s Market. Yes, they cost more than the big box stores, but your chances of success are much greater. Last year the east coast lost much of their tomato crop due to a late blight spread from one mega-nursery, devastating the yields of farmers and gardeners in several states. Buying local and from small nurseries is a good way to avoid these risks. Plant beans, summer squash, cucumbers, basil, and melons. It’s still a little early for okra, which requires warmer soil temperatures. Some folks transplant squash, cucumbers, and melons. I don’t. In addition to being cheaper, direct seeded plants grow more vigorously and catch up and surpass transplants. The main argument I have heard for transplanting is that seedlings are susceptible to the four horseman of gardening: slugs, snails, earwigs, and sowbugs. There is some truth to this, but here are some steps you can take: Shut off automatic sprinklers and consider removing ornamental ground covers that harbor these pests. Take out all or part of your lawn. Clean up piles of lumber, rocks, and miscellaneous debris. Don’t use mulch until the plants are larger and the weather is downright hot. Set up traps (see Adrian Johnson’s article in this issue). Sprinkle diatomaceous earth around seedlings. Water in the morning so that the soil surface is dry by evening. Soil preparations: read a book or two and choose a method. Steve Solomon’s Gardening When it Counts is one of the best. Get your soil tested at least once to establish a baseline for amendments. Many Chico soils are high in magnesium which ties up calcium. Calcium deficiency is a factor in tomato blossom end rot. Gypsum is helpful to have, but you are flying blind if you have never tested your soil. Breaking open the soil deeply can enhance plant growth and increase yields. I used our new broadfork this year. Rototilling will work, but its not ideal. A sharp clean shovel would be better. I f you haven’t yet, buy some seeds tonight. Get together with a friend and split the packets. Write down what you plant and when and where so you can know which varieties worked best for you. Moles eat bugs and worms. They only incidentally damage plant roots. I have an ongoing mole population I wish would move on, but they may think the same about me. We coexist. Gophers are vegetarians and will eat almost any plant except for daffodils (poisonous). There are number of ways to deal with gophers. To create a barrier use ½” hardware cloth as a barrier. Cats are proficient gopher killers. Carl Rosato recommends one cat per acre for orchards. The green wire traps work if set properly. Rub the trap with a vegetable leaf before you set it. Plant a big garden so losing some plants to gophers doesn’t devastate you. If you have methods you are willing to share, please email us. We will publish several hints and also questions in the next issue. Earwigs and slugs and gophers, oh my! I have been organically gardening now for five years and until this year I have been lucky enough not to have a serious pest problem. This year after planting my spring garden I have seen it steadily consumed by earwigs, slugs, and gofers. Every morning I would find that my plants had more and more holes. I went out at night to investigate and found earwigs and slugs all over the place munching away. I have never had such an infestation before. After doing some research I found out that the straw mulch I had left on my beds made for a perfect slug and earwig breading ground. I had hay mulch last year and did not have much of a problem, but this has been a very wet winter and spring. The best way to deal with earwigs and slugs is to eliminate environments for them in the first place. I have been told that I should wait to mulch once the summer heat really turns on. I am currently killing the slugs and earwigs with traps which I would rather not do. I found out about making beer traps from some friends. This really works for slugs and it nabs some earwigs and other bugs too. After experimenting with different traps and doing some research I have found a system that seems to work well. I use a wide tray about 1 inch deep. I am now using disposable baking trays that I bought 2 for a dollar at the dollar store. I put the tray half an inch down into the mulch/soil. I found out that leaving about a half inch lip for the bugs and slugs to crawl over prevents beneficial beetles from being killed. Once the pan is set you just pour in some cheap beer, 1/3 of an inch is sufficient. Any beer will do. Natural Ice A.K.A. “Natty Ice” is popular with college students because it’s cheap. One 24 pack box should be enough for the growing season. The slugs and earwigs are attracted to the beer and somehow drown in it. Do they get drunk, fall in, and drown? Is it toxic to them? Do they consume so much that they destroy themselves? Not very smart, or maybe it has nothing to do with intelligence, there is a very intelligent species that tends to do the same thing. Here is a good video on controlling slugs. The oatmeal thing is new to me. The beer trap catches some earwigs but a trap dedicated to earwigs using cooking oil works much better and seems to only catch earwigs. I found this trap on YouTube ( http://www.youtube.com/watch?v=TjDM3xWK5Lk ). In the video the person uses a $5 dollar Slug and Snail trap. You can make your own for much cheaper. At the local dollar store I bought a one dollar 5 pack of cheap Tupperware containers and a one dollar bottle of vegetable oil. At home I took a razor and cut four ¼ to ½ inch deep slits about 2 inches wide just under the lip of the container. In the garden I sunk the containers in the mulch/ground so that the entrance slits were about half an inch above the surface. I then poured in about a quarter inch of vegetable oil and put the lid on. I took some soil and mulch and covered the lid. Earwigs look for dark crevices when the sun comes out and are more likely to enter the trap if it’s dark inside. My containers are clear plastic so I covered the lid. This trap catches a surprising amount of earwigs. You will catch more earwigs then you thought was possible to have in your garden. Both the beer and oil traps get pretty gros once they have been out for a few days. The beer usually looks worse and can evaporate or be diluted by rain or watering. I found a page that talks about making fertilizer out of flat beer. You don’t have to change out the beer and oil out very often unless you have a problem with how gros It gets. I change out the beer every 3 or 4 days and the oil about once a week. I am thinking of using the old beer and bugs to feed my plants. Waste not want not. The gophers have consumed eight tomato plants, and my cat has to my knowledge consumed two gophers. Yes, he eats the gophers. He eats everything but large rats and moles (doesn’t like the big hands). He even eats his prey after eating half a can of food (weighs in at 18lbs). Although Chiqui is a voracious predator my plants keep on disappearing. I don’t want to use traps because I am worried about my cat. Has anybody had experience with gopher hunting cats and traps? I have had gopher problems before. A few years ago a friend from Corning told me to take chili powder, poor a bunch down the hole, and wash it into the tunnel with a garden hose. A pound of chili powder from the bulk bin at WINCO is about $2.50. Be carful don’t spill it, and if its really windy wait. After heavy rains re-apply. This seems to work for a couple weeks but they come back. I can tell they're back when I notice that my cat has been sitting in one spot staring at the ground for hours. Either that or there is a hole in my row of plants. Today I bought one of those electronic gopher mover stakes. I used one a couple of years ago and it worked but the high pitched noise it made annoyed me and I would have to turn it off when I was out in the garden. The new one I got today speaks gopher and says “Get out of here there’s a predator”. Hopefully it works and doesn’t bug me. The device effectively repels gophers in a radius of about 10 feet although the manufacturer says it cover an area of 3600 square feet. I would need about 4 of them to cover my garden beds. They cost about $14 a piece. Another issue is that it can take 1 to 2 weeks to work. Anybody got better ideas? What works for you? I am all ears. Practical Permaculture Workshop With Cathe Fish at Chaffin Family Orchards May15th-16th. Permaculture offers positive solutions to a planet in crisis. Learn to use nature as your pattern for food production, housing, and community. This course will introduce you to the basic principles and applications of Permaculture through beautiful multi sensory presentations, hands-on projects and handouts. Join us as we gather for our first Garden Wheel event of the season! We will have a potluck after the garden wheel then our monthly meeting as we sit back and relax! Where: Details to come shortly! Project: Design and build rooftop rainwater harvesting earthworks for two downspouts. Learn how to calculate rainwater volume, rooftop measurements and basin size then learn how to use an A-frame level to accurately dig swales and infiltration basins! What to bring: Gloves, hat, shovel, water bottle, tableware and 1 potluck item to share! RSVP on the Guild website to attend this event. If we are going to heal humanity’s relationship with nature, we absolutely must create a new global economy that is primarily human-powered and based on local agriculture. We need to be talking about decisively moving toward something like a 90% reduction in fossil fuel use. All life is crying out for humanity to stop wrecking our sacred planet. There is no technological fix. Of course we need to continue improving every energy-using appliance and device. But manufacturing and selling new gadgets will not save us. Only a fundamental shift in business practices from profit-focused to community-focused structures can deliver the institutional changes we need. Valley Oak Tool Company exists to serve local community-focused human-powered agriculture. Yes, we need to make a profit. But profit is a positive side effect of succeeding at the primary mission, which is to produce the tools needed to power the ecological social revolution (as in returning to our pre-industrial community-focused roots). Gardening to produce food at home and in and around your hometown is an act of independence and patriotism. This is true for citizens of every country on the planet. A true patriot does no damage the land, the water, the air, or people of their own country. Stopping the damage is the next phase in the evolution of planetary democracy. Just stopping is probably the most revolutionary action a patriot can take. Whether we are willing to admit it or not, global industrial culture is suffering from a very severe fossil fuel addiction. Like all other addictions the addiction to mass production and mindless consumption is motivated by the fear of pain. Addiction thrives by not accepting the reality of a situation which leads to a downward cycle of pain and destruction which is difficult for the addicted to stop. Humanity can stop this destructive cycle of addiction even though the challenges of our common reality seem insurmountable. So we at Valley Oak Tool Company are asking you to support our work by buying our tools not only because they are well-designed and built to produce years of service, but also because you are supporting a business that is a leader in the sustainable local organic gardening revolution. You might call the organic gardening movement the real green revolution. Please send us your ideas for products and services that we can offer to further the cause of planetary-local ecological revolution. As you know, the best-tasting most nutritious food you can get is local and organic. Our tools can help you make it happen.